Today, we’re going to tackle STRESS AND OVERWHELM! If I can sum up my day as a mum, juggling businesses and projects, trying to meet deadlines and be present for my children at the same time…. most of the time, you could say it is PURE OVERWHELM. Every day, I’m always running lists in my head, of what I need to do… and there doesn’t seem to be enough hours in a day to do anything! I start the day with great intentions, I’m going to do this and this and this…. And before I know it, I haven’t even scraped the surface of what needs to be done even though I’ve spent all day rushing! Rushing writing content…. Rushing to work, rushing through my work… rushing doing the groceries… rushing with the kids…rush, rush, rush…. What a life huh? Can I get a “Hell yeah!” on this one? Unfortunately, we all go through it. In particular, us women especially go through it and it’s become an epidemic! Dr Libby Weaver author of Accidentally Overweight, calls it the Rushing Woman’s Syndrome. I love that title, because its oh so true! So today, I’m going to walk you through the top 6 tips that I have used personally, to restrict overwhelm in my life and I hope that it helps you too. Tip 1: Write it all down baby!!! When you’re mind is going a hundred miles and hour, with all the things you have to do… I find that if I just grab a notebook and pen and write it all down, I remove all the noise in my head and do a plain old BRAIN DUMP. Every thought, every project… everything that I have to do, big or small… I get it all down on paper. You’ll find that once you have it all down, the list isn’t as long as you think…. And by having it in plain sight, you can then, start to prioritise. We’ve heard it all before… and it friggin works! So if you’re not doing this on a daily basis, try it! And see what happens! Your mind will be a whole lot clearer once you brain dump. Tip 2: Quit Caffeine! And that’s right… I especially mean that COFFEE that you can’t survive without! Oh no, it’s the end of the world! I can hear you all screaming right now… NNNNNOOOOO!!! Oh ladies, I used to feel the same way too. I love my coffee! I think I’m seriously addicted to the ritual of buying one, holding the hot cup in my hands and drinking the hot elixir. But guess what I only just found out? Well you see, for the past few months, I’ve been really trying to listen to the way my body feels. And I’ve noticed, that my hands have been sweating a lot, or I have a hard time breathing when I’m sitting at my desk and I felt anxious all the time. It’s not like I’m overly stressed or anything. Everything is great in my life…. But I couldn’t help wonder what was causing my body to react in this way. It wasn’t until I paid attention to when I drank my coffee, one morning when I realized that as I drank it… my hands started to sweat and I started feeling anxious again. Instantly I knew that it was the coffee!!! So I had to make a decision, should I continue with my love of coffee every morning and live with the anxiety and stress, or should I replace it with Camomile tea – something that I heard is great for anxiety? The very first day, I replaced it with Camomile tea, I was calmer and my hands were dry. Now how about that? And I also noticed that when I spoke to others, I wasn’t frantic! So it turns out that Caffeine is a powerful nervous system drug that keeps your body on red alert and stimulates the body to the point of overwhelm. So if you’re bitchy, snappy, lack patience… are sad or have low energy… get rid of the coffee and replace it with Green Tea, Ginger Tea or Camomile tea. Trust me, you’re body will love you for it! This could be in the form of sitting still and breathing or you could learn an active meditation, where you actually think about something… or you could do some yoga. Whatever it is, try to find some time to stop and be still. 10-20mins a day is enough, for those wild, crazy rushing women out there. If you have kids, try to wake before them and start your day with a little meditation. You can just sit up in bed and do it, if that’s easier for you. You will find that you are more clear headed, focused, energized… and calm. You build your resilience to stress and you don’t lose it every minute. It’s hard at first, but as you do this regularly, you’ll find that it does get easier and you’ll be a better person for it. Tip 4: Get some sleep! That’s easy for you to say! I can hear you thinking. Like me, you’re probably using the evenings, when your children are asleep or after work to do more work, because in our minds… (there’s not enough time in the day, let alone sleep, right?). But damn girl, when you can, try to get yourself to bed a little early. As you know, when you’re tired… your resilience to stress diminishes completely. You get grumpy, short tempered and feel extremely overwhelmed. Getting good sleep is one of the MUST DO tips on this list, because it is the key to amazing health. You’re giving your body the time to reenergize and heal itself. Tip 5: Find some me time! I know, I know… finding me time, might not be easy. Just schedule it into your diary and do it. Studies show that when you spend some time on your own… it decreases stress and increases creativity! One of the things that I like doing, is to go in search for a little piece of nature. Whether it’s a tree or a patch of grass. Then I’ll either sit under it or walk on the grass bare footed. When you’re really in tune with how your body feels, you’ll feel your feet tingle with the earths energy. The earths energy has amazing benefits to healing and protect your cells from inflammation and cell damage. Read up on it, this stuff will astound you! And last but not least, move your body!!! Yes we hear it all the time, but exercise is sssooooo good for your mind!!! If you struggle to find the time, then instead of taking the elevator, maybe take the stairs instead? Instead of parking your car at the door… maybe park it a block away? Look for any opportunity to exercise and move your body. If the gym is too boring for you… go look up a yoga class or a dance class! Do an exercise that you will actually enjoy, that will take your mind off “exercising”. You’ll find that you will enjoy more energy and you’ll have happier cells. 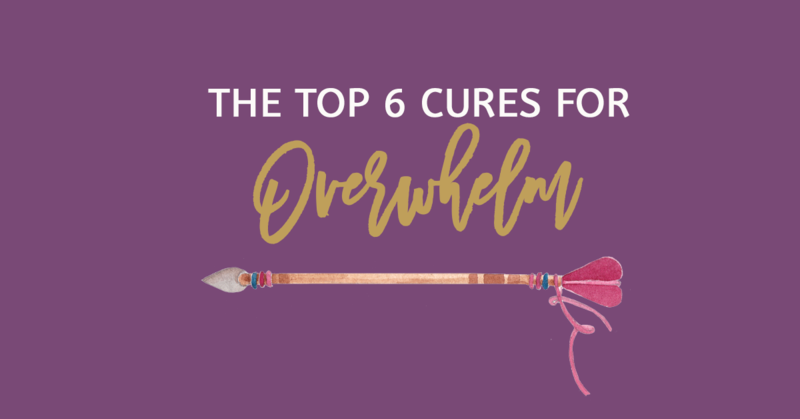 And that Wild Woman, are the Top 6 cures to overwhelm. Remember, your mind and your body is an amazing vessel. When you look after both, you will be a much happier person, you will be calmer, you will build up a strong resilience to challenges, you will have increased energy…you’ll stop rushing and actually start enjoying the moment! Something definitely worth striving for! Until next week Wild Woman! See ya!